Young was met at the train depot in Cleveland by members of the Spiders. He was dissuaded from purchasing a return ticket to Canton in case his time on the mound was a disaster. “Well, I’ll pitch a game,” Young said, “and if I win I’ll stay. If I lose I’ll go home this evening.”6 Cy Young may have been that close to spending the rest of his life on the farm instead of dominating the pitcher’s mound. Sporting Life reported that Young and another player went to a tailor in Cleveland to be fitted for uniforms. Team secretary George Howe ordered the tailor not to make Young’s uniform until after he had pitched a game. Following Young’s winning debut, there was a mad scramble to get the uniform finished.7 Young was definitely there to stay. Cleveland was 24-60, seventh in the eight-team National League, 32 games behind first-place Brooklyn. Chicago was 43-41 and in fifth-place, 13 games behind. Chicago would become the best team in the league for the remainder of the season, going 40-12 and finishing second, only 6 ½ games behind Brooklyn. Their pennant drive was just too little, too late. Opposing Young was Chicago’s 30-year-old right-hander William “Wild Bill” Hutchinson. Hutchinson would win 41 games for the Colts that season, leading the National League. 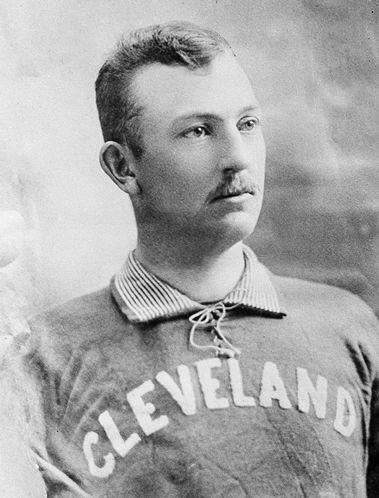 Cleveland secured all the runs they needed in the first inning which the Leader and Herald said “put a great big load of confidence into Young’s heart.”13 Ed McKean walked, and Hutchinson threw wild to Anson, giving Will Smalley first and sending McKean to third. Jake Virtue walked. McKean scored on an error by Tom Burns, and Smalley and Virtue scored on a hit by Buck West. Cleveland led 3-0. If not for Young’s own error, his first major league start would have been a shutout. The Colts scored their only run, unearned, in the fourth. Walt Wilmot walked, stole second, and went to third on Young’s bad pickoff attempt at second. He scored on a Burns single. In the eighth, Zimmer tripled, or “knocked all the knots out of the left field fence with a three-base hit that was loaded to the muzzle with ginger” and scored on a Ardner single, to give the Spiders their 8-1 final edge. In addition to the sources listed in the Notes, the author also relied on the Baseball-Reference.com website and Alvin K. Peterjohn’s “The First Year of Cyclone Young,” in the 1976 SABR Baseball Research Journal. 1 “Anson’s Loss and Gain,” Inter Ocean, August 7, 1890: 6. 3 “Couldn’t Hit Young,” Cleveland Leader, July 26, 1890: 3. 4 The “tri-state” reference in the League’s name was to Ohio, Michigan, and West Virginia, dating to 1888. In 1890, however, there was no Michigan representative in the Tri-State League, but there was a Pennsylvania team, the McKeesport Tubers, Young’s July 25 victims. 5 Reed Browning. Cy Young: A Baseball Life. Amherst, MA, University of Massachusetts Press, 2003, 8. 6 “Young’s First Game,” Cleveland Plain Dealer, March 10, 1896: 8. 7 “A Narrow Escape,” Sporting Life, June 17, 1899: 3. 8 “Young’s Great Work. The League Club’s New Find Turns out to be a Wonder,” Cleveland Plain Dealer, August 7, 1890: 5; Jed Prouty and Josh Whitcomb were both fictional country bumpkin characters in plays during the era who leave their rural farms to explore the big city, with hilarious results. 9 “Some Great Ball,” The Leader and Herald (Cleveland, Ohio), August 7, 1890: 3. 10 “Nationals to be Well Fortified,” Washington Herald, July 30, 1911. 11 “Baseball Talk,” Repository (Canton, OH), April 18, 1890: 4. 12 “Nationals to be Well Fortified,” Washington Herald, July 30, 1911. 16 An ancient Persian unit of distance. TheFreeDictionary.com, accessed November 3, 2016. 18 Ibid. Glenville and Newburg are Ohio cities located roughly five to six miles from Cleveland. 19 Alfred Henry Spink. The National Game: A History of Baseball, America's Leading Out-door Sport, from the Time it was First Played Up to the Present Day. St. Louis: National Game Publishing Co., 306. 20 Charles Mears, “In the Forest City,” The Sporting News, August 16, 1890: 1. 21 “Gossip of the Players,” The Sporting News, November 12, 1904: 4.